No wonder why Mykonos Island is a favorite destination worldwide; visitors from all around the globe choose it for their holidays for a thousand different reasons, since the famous Cycladic Island has so much to offer for every type of traveler. Golden sand and azure waters can satisfy even the most demanding one. 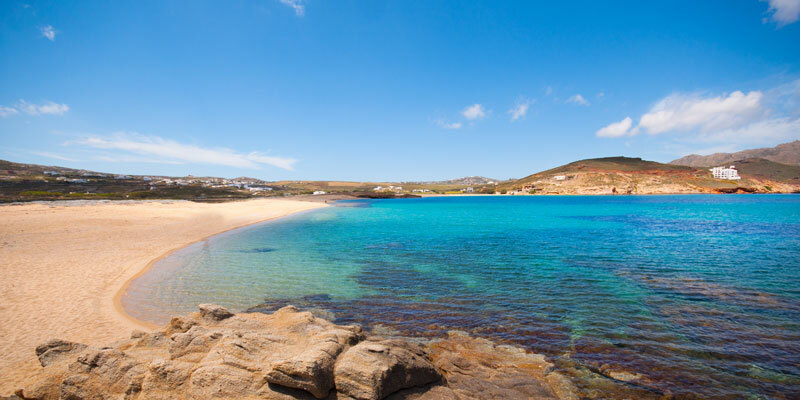 Take a journey through the best beaches in Mykonos, either if you are looking for a party beach such as Super Paradise or Paradise Beach, either if you wish to enjoy the cosmopolitan character of Psarou Beach and Kalo Livadi or even if you are just looking for one of the secluded privates beaches in Mykonos. Fully organized, Psarou beach offers glamour and prestige. It is the place to see and to be seen. It is a sandy beach with crystal clear waters, umbrellas and sunbeds. Be ready to live a VIP experience and be prepare to party, as any time or any occasion can be a good excuse for celebration at Psarou beach. Platis Gialos is a fully organized beach. Surrounded by hills, it is well protected by the wind, while its shallow and sandy shoreline makes it the perfect choice for families. You will find a variety of amenities, like café, tavernas, restaurants and bars. Paranga beach is one of the most popular beaches of Mykonos, originally famous by the hippie generation back in the 70’s. A sandy beach, with crystal clear water where the relaxation gives way to the party atmosphere as the day fades away, and the music is set loud at the beach bars. This beautiful beach is primarily a destination for the young people. If you are thinking of a wild beach party with the music set out loud, then you are the right place. The party never ends! Enjoy your day swimming in the crystalline waters and lay back and absorb as much sun as you can at the amazing sandy beach of Super Paradise. Be prepared as the evening party will start and the multicultural, trendy, gay and celebrity crowds will dance to the rhythm set by the djs. Agrari beach has remained one of the quietest beaches of Mykonos. One can find shelter here away from the busy crowds. At this rubbly sand beach, you will find sunbeds and umbrellas. Do not miss the chance to do some water sports, as people from “WaterAction” School will take the best of care of you. Elia beach is one of the prettiest beaches of Mykonos, while being the longest sandy beach. It is a meeting point for cosmopolitans, inviting a mix crowd and it is fully organized with umbrellas and sunbeds for rent. Enjoy a swim into the amazing turquoise water. Kalafatis Beach is the meeting point for the lovers of the wind-surfing. You can rent here all the necessary equipment or use your own. The athletic ones find here their paradise on earth. Agia Anna is a small hidden beach of low profile with clear blue-green water. It is an alternative to the crowded southern beaches, rather protected from the strong winds and offering a slice of real fishermen’s life. Located at the south eastern edge of Mykonos, Lia is one of the most beautiful beaches due to its blue waters and the white sand. It is the perfect place to be if you want to get away from the crowd, as it is considered one of the quietest beach for Mykonos’ standards. 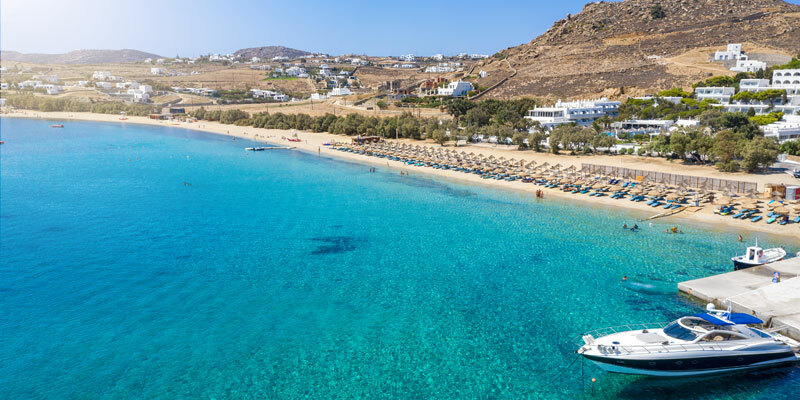 Located at the southwest corner of Mykonos, Ornos beach is the perfect family beach. It is extended and sandy, offering a full – scale of facilities that one could ask for. Here you will find bars, cafes, taverns and restaurants. This beach was named after the little chapel of Agios Stefanos, which one can find it at the further end of this bay. It is a sandy beach that welcomes families as its swallow waters are ideal for the little children. It is well organized beach with sunbeds and umbrellas. 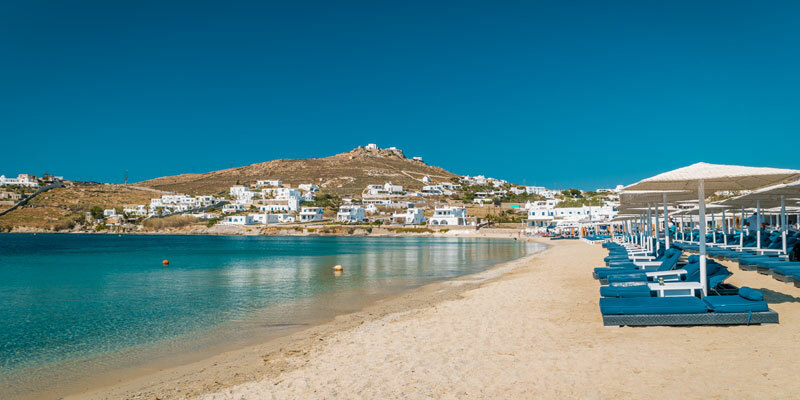 Being close to the city of Mykonos, Megali Ammos is a sandy beach where you will find no umbrellas or sunbeds as it is not well protected by the north winds and it is also at very close distance from the main road. Located on the South West side of the island, Glyfadi is a small beach, preferred by families. You will find no bars or restaurants here, but there are only a few sunbeds and umbrellas. Situated on the south-west coast of the island, Agios Ioannis is a fully organized, wind-protected beach, ideal for families or incognito VIPs. It is one of the best places to be when the sun is going down, having right in front of you the island of Delos. 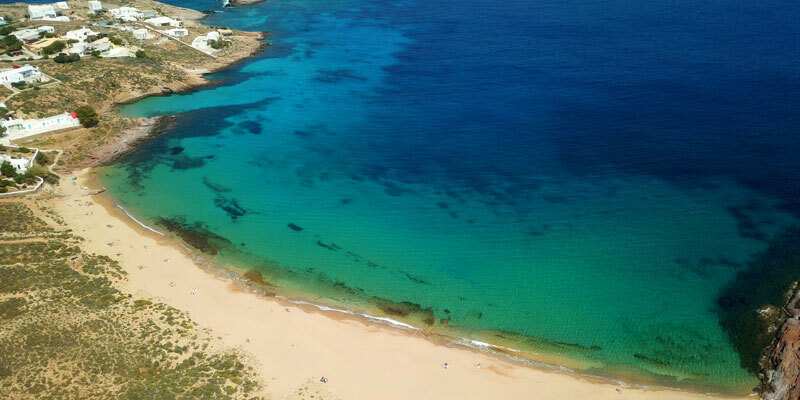 Exposed to the strong winds that whip around the Panormos Bay, Ftelia is famous among the wind-surfers enthusiasts. It is a quiet, non-organized beach, though sunbathing and swimming is not easy due to the blowing winds. Located at the north of Mykonos, Fokos beach is a quiet, secluded one. If you want to avoid the crowds and spend your day in relaxation and reflection, visit this beach but note that there are no amenities like umbrellas and sunbeds. When the wind blows from the south, visit this fascinating beach. Panormos it is a sandy, remote beach, while at its left many families enjoy their swim at the swallow shoreline and at its right the nudism is considered acceptable. Agios Sostis is one of the remotest, non-organized beaches of Mykonos due to its location. It used to be the preferable choice among the nudists. It has still preserved its identity and nowadays many visitors come to enjoy this sandy uncrowded beach.